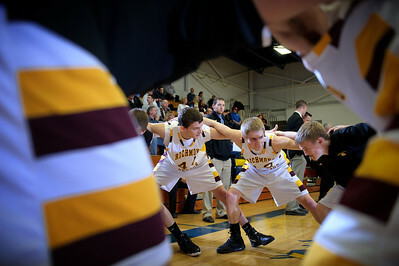 Daniel J. Murphy - dmurphy@shawmedia.com The Richmond-Burton basketball team forms a circle as starters are announced against Marian Central Wednesday February 29, 2012 at Johnsburg High School in Johnsburg. 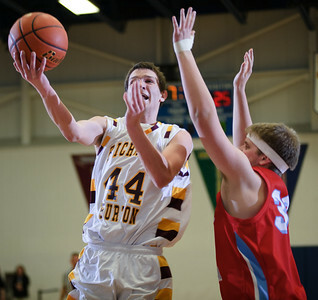 Richmond-Burton defeated Marian Central 40-36. 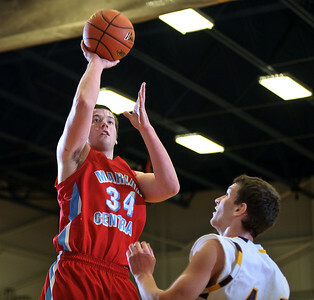 Daniel J. Murphy - dmurphy@shawmedia.com Marian Central's Dustin Daily puts up a basket in the first quarter Wednesday February 29, 2012 at Johnsburg High School in Johnsburg. Richmond-Burton defeated Marian Central 40-36. Daniel J. Murphy - dmurphy@shawmedia.com Marian Central's Dustin Daily makes a move to the basket in the first quarter Wednesday February 29, 2012 at Johnsburg High School in Johnsburg. Richmond-Burton defeated Marian Central 40-36. 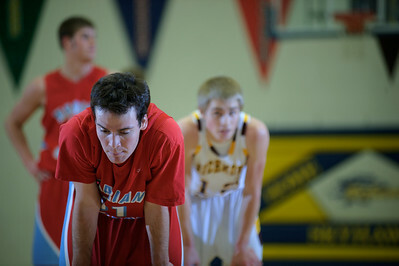 Daniel J. Murphy - dmurphy@shawmedia.com Marian Central point guard Ross Kendzior (left) catches his breath before shooting a free throw in the first quarter Wednesday February 29, 2012 at Johnsburg High School in Johnsburg. Richmond-Burton defeated Marian Central 40-36. Daniel J. Murphy - dmurphy@shawmedia.com Richmond-Burton forward Matt Rygiel (left) attempts a basket under pressure from Marian Central's Gerry Mcmaster (right) in the third quarter Wednesday February 29, 2012 at Johnsburg High School in Johnsburg. 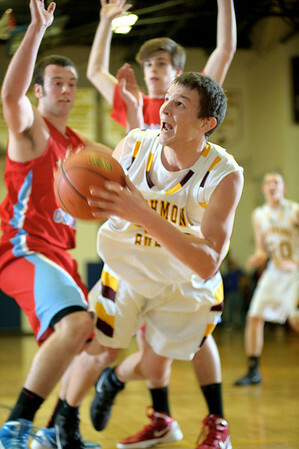 Richmond-Burton defeated Marian Central 40-36. Daniel J. Murphy - dmurphy@shawmedia.com Marian Central forward Zach Ricchiuto (left) shots a basket over Richmond-Burton forward Matt Rygiel (right) in the second quarter Wednesday February 29, 2012 at Johnsburg High School in Johnsburg. 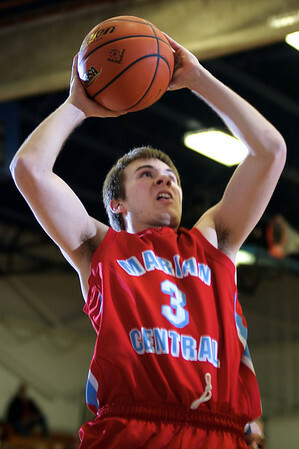 Richmond-Burton defeated Marian Central 40-36. Daniel J. Murphy - dmurphy@shawmedia.com Richmond-Burton forward Matt Rygiel (center) falls to the floor on a drive to the basket in the third quarter Wednesday February 29, 2012 at Johnsburg High School in Johnsburg. 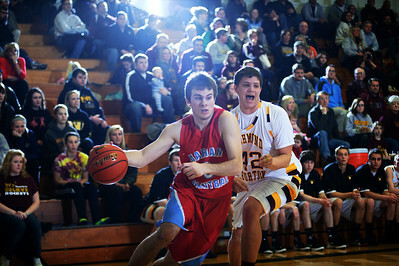 Richmond-Burton defeated Marian Central 40-36. Daniel J. Murphy - dmurphy@shawmedia.com Richmond-Burton guard Brian Wells (right) shoots past Marian Central's Kyle Thompson (left) in the third quarter Wednesday February 29, 2012 at Johnsburg High School in Johnsburg. Richmond-Burton defeated Marian Central 40-36. Daniel J. Murphy - dmurphy@shawmedia.com Richmon-Burton guard Chris Vlasak listens to head coach Brandon Creason during a timeout late in the fourth quarter Wednesday February 29, 2012 at Johnsburg High School in Johnsburg. Richmond-Burton defeated Marian Central 40-36. Daniel J. Murphy - dmurphy@shawmedia.com Marian Central head coach Curtis Price calms point guard Max St. Clair listen late in the fourth quarter Wednesday February 29, 2012 at Johnsburg High School in Johnsburg. Richmond-Burton defeated Marian Central 40-36. 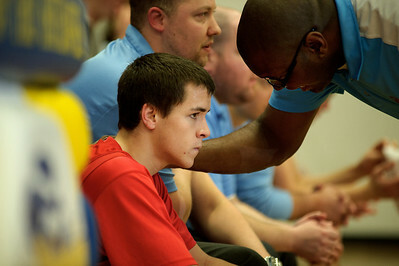 Marian Central head coach Curtis Price calms point guard Max St. Clair listen late in the fourth quarter Wednesday February 29, 2012 at Johnsburg High School in Johnsburg. 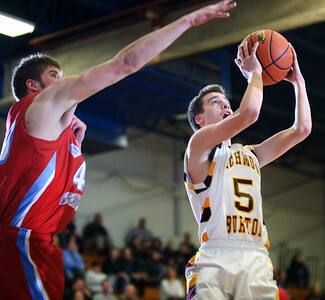 Richmond-Burton defeated Marian Central 40-36.